It is important that you season your Wok before cooking. The great thing about a Wok is that you only have to season them once, unless you wash them with detergents. Add a small amount of water and washing up liquid to the centre of the Wok. Using a scouring pad, give your Wok a good scrub all over (make sure you clean the outer surface too). This is done to clean off any oils and chemicals from the manufacturer. Add a small amount of oil to your Wok and heat up. Add the seasoning ingredients to the Wok. Now, for 15 – 20 mins continuously stir all of the contents around the edges of the Wok. Once the inside of your wok has been coated in oil, empty the contents and rinse with clean water. Tear off a few squares of kitchen paper and rub your wok dry. Over time oils will build up on your Wok, but don’t worry you want this to happen! The thicker the residue on your wok, the better your food will taste. You should never really clean your Wok, simply rinse it under running water when you have finished cooking with it. To make your haggis balls all you need to do is break up the haggis and roll/squish them into shape using your hands. 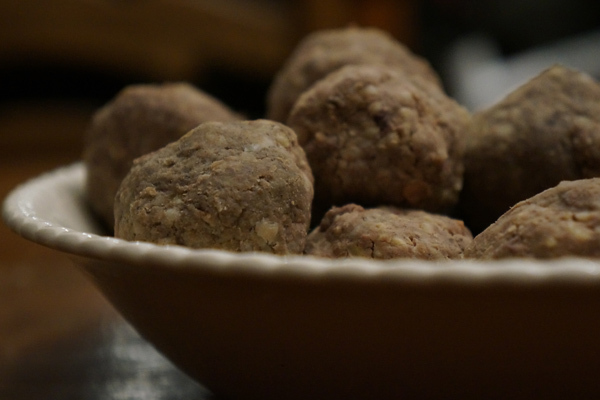 Ideally, you want 3 haggis balls for each individual. 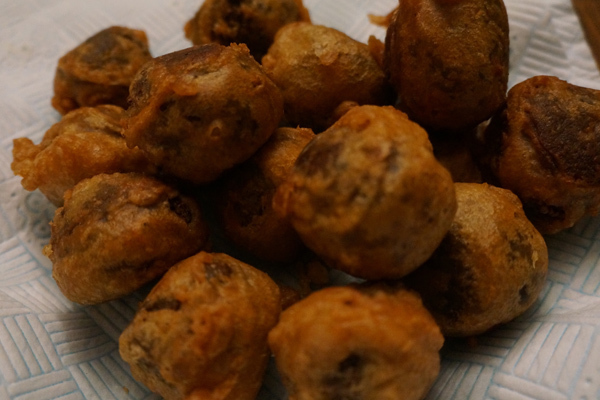 Lightly coat each ball in plain flour, so that they are then ready for dipping in batter. Sieve 150g of plain flour and the paprika into a bowl. Slowly add the Chinese beer to the flour until it reaches the consistency of double cream (making sure there are no lumps!). Set aside so you can prep your vegetables. Now it’s time to prepare your veg. For aesthetic purposes, slice your spring onions and lemon grass sticks diagonally. Chop your carrot into tiny thin sticks. Mince the stems of the coriander. 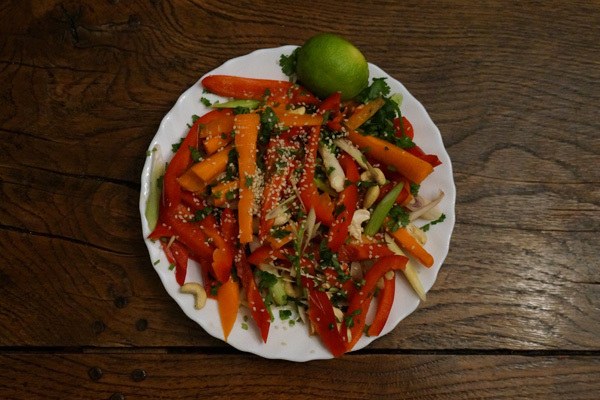 De-seed and slice your chilli and red pepper into thin strips. Cut your ginger and garlic into small pieces, so that they can be scattered throughout the dish. Finally add the sesame seeds, beansprouts, cashew kernels and lime juice. Now add everything to a big bowl and mix together with your hands until everything has been combined. Add enough vegetable oil to your Wok for frying. The best way to test if your Wok is hot enough for cooking is to add a little bit of batter to the pan and see if it starts to fry. As soon as it starts to fry and crisp then you know it’s ready. 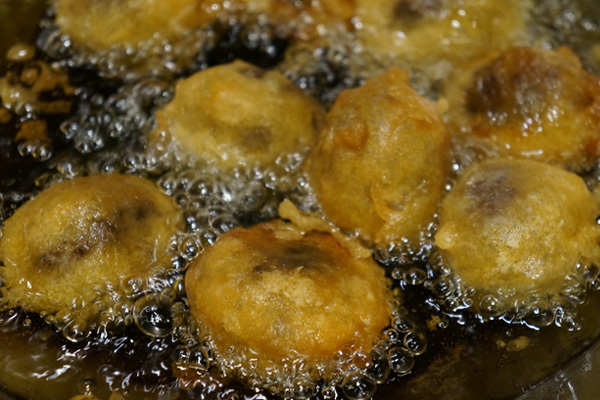 Dip each haggis ball in the beer batter, making sure it is coated all over, then place into the Wok to fry. Once the batter turns a deep golden brown colour all over take them out as they will now be cooked. Pour out the left over oil from frying your haggis and pour in a small amount of fresh vegetable oil. 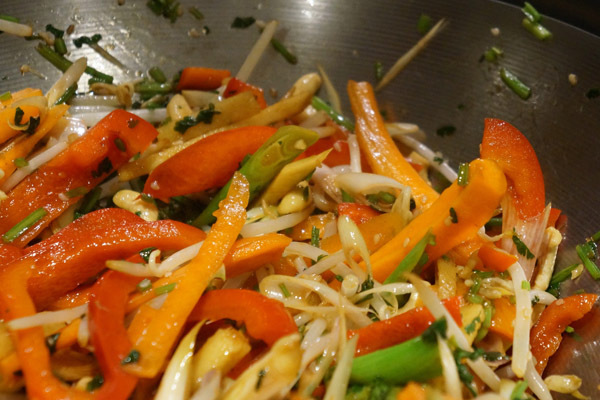 Add the veg, honey and Soy sauce to the Wok and keep moving the contents around; don’t let them sit still. 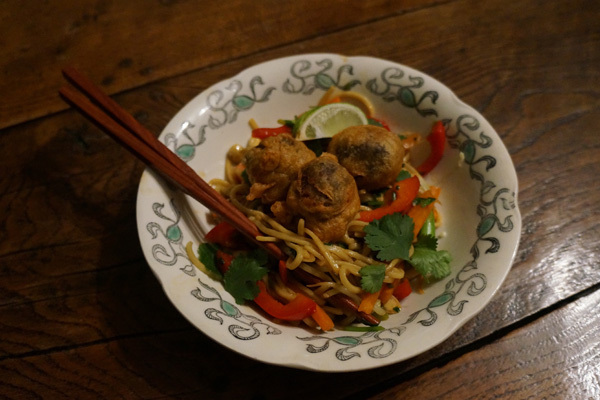 Everyone has a different preference to how they want their veg cooked, so once you are happy with how it tastes add your noodles. Your noodles have already been cooked, so you just need to heat them up. Add a sprinkling of coriander leaves. Serve with traditional chop sticks, Chinese beer, and some deliciously sweet chutney (we suggest mango!). Enjoy! Need a Wok for this recipe? Browse a wide range of Woks and other cooking accessories via our website. 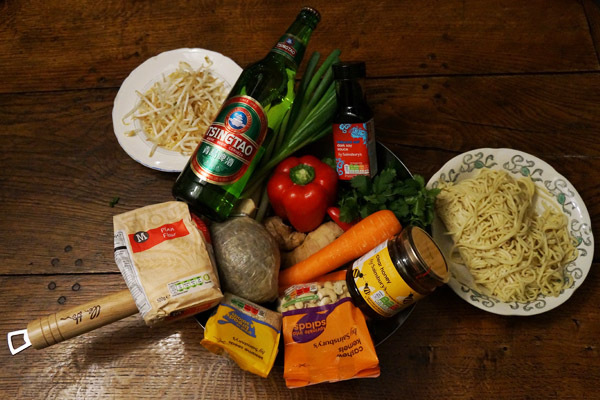 Chinese Beer, Chinese New Year, cooking, Haggis, Ken Hom, Robert Burns Night, Seasoning Your Wok, Stir Fry, Vegetables, Wok. Bookmark.